My search for academic writings on Hindi films have started to bear some fruit over the recent past. If week 10 was spent with Helen, then weeks 11/12/13 had leading men of different types for company. 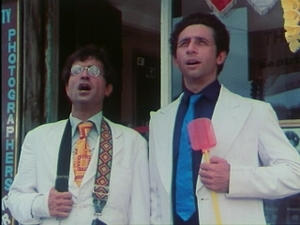 The first of them were Vinod Chopra and Sudhir Mishra as portrayed by Naseeruddin Shah and Ravi Baswani respectively, in the cult classic Jaane Bhi Do Yaaron released in 1983. A well-researched behind the scenes look is offered by Jai Arjun Singh's book "Jaane Bhi Do Yaaron (जाने भी दो यारों) - seriously funny since 1983", which was my companion for Week 11. In the author's own words, "It's very difficult to describe this film to someone who hasn't experienced it first hand", so I am just going to assume that you've watched the film. If you haven't then drop everything (yes leave this blog too for the time being) and go watch it, it's that awesome. Once you have watched it and become a fan (yes that's inevitable, at the risk of repeating myself let me say that the movie is that awesome) you will be able to get much more out of this book. The book takes you on a fascinating journey through the making of the film, and explains how it almost came to not be. Almost all the names associated with the movie, in acting roles or otherwise, are pretty well-known now and you'd be amazed to note how such a vast group of talented people happened to come together for this film. My favourite bits from the book are about the escapades of brilliant actor Pawan Malhotra, who served as the director Kundan Shah's man Friday for this movie. Although he's not acted in this movie, you'll understand when you read this book just how important he was to the making of this film. You'll also feel sorry for the fact that the scenes of Anupam Kher's Disco Killer, that were shot but never made it to the final print, are lost forever and live on only in anecdotes - ditto for the talking gorilla. These, and many more such factoids make this book a marvelous read, and make you appreciate the hard work and time that has gone into bringing about this book. Go read.